Manufacturers added 31,000 workers in February, and revisions in the December and January data increased employment in the sector by 28,000 in total from previous estimates. As such, the latest jobs numbers confirm that the labor market has tightened significantly, with manufacturers increasing employment by a rather robust 18,876 per month on average since the end of 2016. That is quite a turnaround from the sluggish job growth in 2016, and it is a sign that firms have continued to accelerate their hiring as the economic outlook has strengthened and demand and production have improved considerably. Indeed, manufacturers have told us that challenges in recruiting new workers is their primary business concern right now. Along those lines, average weekly earnings for production and nonsupervisory employees in manufacturing rose from $891.63 in January to $900.55 in February. That translated into 3.8 percent growth over the past 12 months, up from $867.30 in February 2017, which further illustrates the strength of the labor market right now. Since the end of the Great Recession, manufacturing employment has risen by 1,161,000 workers, with 12.61 million employees in the sector in this report. That is the highest level of manufacturing employment since December 2008. Overall, nonfarm payrolls increased by 313,000 in February, the fastest monthly pace since July 2016 and well above the consensus estimate of around 200,000. Over the past 14 months, the U.S. economy has added 195,714 each month on average—a strong figure. Meanwhile, the unemployment rate was unchanged at 4.1 percent for the fifth straight month, continuing to be the lowest level since December 2000. In addition, the labor force participation rate ticked up from 62.7 percent to 63.0 percent, matching the rate in September, which was the best since November 2013. Improvements in the global economy have also helped to boost manufacturing in the United States, and trade volumes have risen significantly over the past year on the better outlook. (For more information on such trends, see the latest Global Manufacturing Economic Update.) In fact, international demand has started 2018 on a positive note, extending the rebound in 2017. U.S.-manufactured goods exports were $86.36 billion in January, up 3.94 percent from $83.09 billion one year ago. This builds on progress seen in 2017, where U.S.-manufactured goods exports rose 4.66 percent, according to TradeStats Express. That was much better than the declines of 6.20 percent and 4.04 percent in 2015 and 2016, respectively. Despite such positive news, new factory orders fell 1.4 percent in January, declining for the first time since July, mainly on large decreases in aircraft orders, which can be highly volatile from month to month. Excluding transportation equipment, new orders for manufactured goods rose 0.4 percent in January. Overall, new factory orders have trended sharply higher over the past year. Along those lines, sales of manufactured goods have soared 6.6 percent since January 2017, or 6.5 percent excluding transportation equipment sales. In addition, core capital goods—or nondefense capital goods excluding aircraft—decreased 0.3 percent in January, but rose a healthy 6.3 percent over the past 12 months. This measure is often seen as a proxy for capital spending in the U.S. economy. Finally, consumer spending has been one of the stronger elements in the economy, with healthy retail sales at the end of last year. With that said, purchases slowed in January, as seen in the latest data. That was further echoed in new figures from the Federal Reserve on U.S. consumer credit outstanding. While overall credit rose 4.3 percent at the annual rate in January, it decreased from 6.0 percent growth in December and registered the slowest pace since September. Americans had increased their willingness to take on credit card debt in November and December, which helped to propel strong holiday sales. However, that willingness slowed considerably in January. With that said, consumer credit has increased 5.3 percent year-over-year, and this pace remains stronger than this time last year. This week, there will be several reports issued that will show the health of the manufacturing sector and the larger economy. Manufacturing production was unchanged in January, with 1.8 percent growth over the past 12 months. In February, the sector should once again show modest growth, building on healthy gains last year. Moreover, the New York and Philadelphia Federal Reserve Bank districts should show continued strength in their March manufacturing surveys. There will also be important releases on retail spending and the housing market. Other highlights this week include updates on consumer confidence, consumer and producer prices, job openings, small business optimism and state employment. ADP reported that manufacturers added 14,000 workers in February, once again extending the strong job gains in the sector as production and the overall outlook have improved substantially. Indeed, manufacturing business leaders have hired at a robust rate since the end of 2016, averaging nearly 14,700 per month over the past 14 months. In contrast, manufacturing employment was more sluggish in 2016, illustrating the turnaround in the labor market since then. More importantly, we expect continued strength in job growth moving forward. Meanwhile, total nonfarm private employment increased by 235,000 in February, easing from 244,000 workers added in January but notably better than the consensus estimate of around 195,000. As a reference, nonfarm private payrolls have risen by 193,097 per month on average since the end of 2016, up from a monthly average of nearly 172,500 in 2016. In February, the largest employment growth included leisure and hospitality (up 50,000), professional and business services (up 46,000), trade, transportation and utilities (up 44,000), education and health services (up 43,000), construction (up 21,000) and financial activities (up 9,000). Employment in the information sector fell by 1,000 for the month. Small and medium-sized businesses (i.e., those with fewer than 500 employees) accounted for 70.2 percent of the net job growth for the month. The Bureau of Labor Statistics reported that manufacturers added 31,000 workers in February, and revisions in the December and January data increased employment in the sector by 28,000 in total from previous estimates. As such, the latest jobs numbers confirm that the labor market has tightened significantly, with manufacturers increasing employment by a rather robust 18,876 per month on average since the end of 2016. That is quite a turnaround from the sluggish job growth in 2016, and it is a sign that firms have continued to accelerate their hiring as the economic outlook has strengthened and demand and production have improved considerably. Indeed, manufacturers have told us that challenges in recruiting new workers is their primary business concern right now. Along those lines, average weekly earnings for production and nonsupervisory employees in manufacturing rose from $891.63 in January to $900.55 in February. That translated into 3.8 percent growth over the past 12 months, up from $867.30 in February 2017, which further illustrates the strength of the labor market right now. Since the end of the Great Recession, manufacturing employment has risen by 1,161,000 workers, with 12.61 million employees in the sector in this report. That is the highest level of manufacturing employment since December 2008. In February, durable goods manufacturers added another 32,000 workers on net, but employment at nondurable goods firms fell by 1,000. The largest increases included transportation equipment (up 8,200, with motor vehicles and parts up 6,200), fabricated metal products (up 5,900), machinery (up 5,600), primary metals (up 3,700), wood products (up 3,300), furniture and related products (up 1,900), petroleum and coal products (up 1,800) and nonmetallic mineral products (up 1,600), among others. 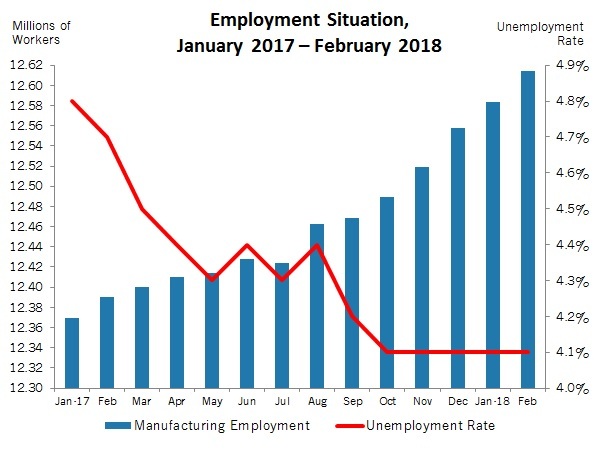 In contrast, February employment declined for plastics and rubber products (down 2,000), chemicals (down 1,100), textile product mills (down 700), textile mills (down 200) and apparel (down 100). The Federal Reserve Board reported that U.S. consumer credit outstanding rose 4.3 percent at the annual rate in January, down from 6.0 percent growth in December and the slowest pace since September. Total consumer credit was $3.855 trillion in January, with $1.030 trillion in revolving credit and $2.825 trillion in nonrevolving credit. Across the past 12 months, consumer credit has increased 5.3 percent, with revolving and nonrevolving credit up 6.1 percent and 5.0 percent year-over-year, respectively. Revolving credit, which includes credit cards and other credit lines, changed little in January, up just 0.8 percent at the annual rate. This contrasts to annualized growth rates of 13.4 percent and 7.2 percent in November and December, respectively. It was this increased willingness to take on credit card debt at the end of last year that helped spur solid holiday spending. Meanwhile, nonrevolving credit, which includes auto and student loans, remained at 5.6 percent at the annual rate. That figure represents slowing over the past few months, down from an annualized 8.5 percent growth rate in November. The Census Bureau reported that new factory orders fell 1.4 percent in January, declining for the first time since July, mainly on large decreases in aircraft orders, which can be highly volatile from month to month. Indeed, defense and nondefense aircraft and parts orders plummeted 45.6 percent and 28.4 percent, respectively, in January, but those decreases followed significant jumps in the prior two reports. Excluding transportation equipment, new orders for manufactured goods rose 0.4 percent in January. Overall, new factory orders have trended sharply higher over the past year. Along those lines, sales of manufactured goods have soared 6.6 percent since January 2017, or 6.5 percent excluding transportation equipment sales. Core capital goods—or nondefense capital goods excluding aircraft—decreased 0.3 percent in January. These can often be seen as a proxy for capital spending in the U.S. economy, and this figure has drifted lower over the past two months. Encouragingly, however, much like the headline numbers, there was a healthy gain of 6.3 percent over the past 12 months. Durable goods demand declined 3.6 percent in January, but excluding transportation, new orders fell just 0.3 percent. In contrast, sales of nondurable goods increased 0.8 percent in January. Looking specifically at durable goods activity in January, new orders rose for fabricated metal products (up 0.8 percent) and computers and electronic products (up 0.5 percent) but decreased in most of the other major categories, including furniture and related products (down 1.8 percent), electrical equipment, appliances and components (down 0.6 percent), motor vehicles and parts (down 0.5 percent), machinery (down 0.4 percent) and primary metals (down 0.3 percent). Meanwhile, shipments of manufactured goods increased 0.6 percent in January, with durable and nondurable goods orders up 0.3 percent and 0.8 percent, respectively. On a year-over-year basis, factory shipments have risen 6.1 percent since January 2017, or 6.5 percent excluding transportation.. The Bureau of Economic Analysis and the Census Bureau reported that the U.S. trade deficit rose from $53.91 billion in December to $56.60 billion in January, its highest level since October 2008. While that headline will likely make news, it is important to note that trade volumes have risen significantly over the past year as the overall health of the global economy has strengthened. Goods exports have increased from $127.51 billion in January 2017 to $134.25 billion in the latest figures, up 5.3 percent over the past 12 months. Goods imports jumped 7.2 percent year-over-year, up from $196.51 billion to $210.74 billion. Nonetheless, a decline in goods exports in January was the main culprit in pushing the trade deficit higher, as exports were $137.22 billion in December. More importantly for manufacturers, exports have started 2018 on a positive note, extending the rebound in 2017. U.S.-manufactured goods exports were $86.36 billion in January, up 3.94 percent from $83.09 billion one year ago. Digging deeper into the latest release, goods exports mostly decreased, as noted above, led by declines in non-automotive capital goods (down $2.55 billion) and industrial supplies and materials (down $1.33 billion). More positively, goods exports increased for consumer goods (up $1.17 billion) and automotive vehicles, parts and engines (up $486 million). At the same time, the goods imports picture provided mixed results. The increase in goods imports for industrial supplies and materials (up $1.95 billion) was offset by reductions for non-automotive capital goods (down $1.33 billion) and consumer goods (down $879 million). The Bureau of Labor Statistics reported that manufacturing labor productivity rebounded strongly in the fourth quarter, up 6.0 percent at the annual rate. This was an improvement from the 5.7 percent rate in a prior estimate. Hurricane-related weaknesses pulled the third-quarter figures lower, with labor productivity and output down 4.7 percent and 1.6 percent, respectively, in that report. In contrast, output soared 6.6 percent in the fourth quarter, reflecting both a recovery from the hurricanes and stronger economic growth. Hours worked in the sector rose 0.5 percent in the fourth quarter, with unit labor costs off 3.3 percent. The sectoral breakdowns also showed encouraging signs, with labor productivity for durable and nondurable goods firms up 8.1 percent and 3.4 percent, respectively. For the year, manufacturing labor productivity increased 0.6 percent, with output and unit labor costs up 1.6 percent and 1.0 percent in 2017, respectively. The annual figure for manufacturing labor productivity growth was slightly better than the average seen from 2013 to 2017, which was just 0.4 percent. Indeed, sluggish productivity growth continues to be one of the larger frustrations in the U.S. economy in the aftermath of the Great Recession. In comparison, the average growth rate for manufacturing labor productivity was 3.9 percent in both the 1990–2000 and 2002–2008 time frames, or the two prior economic recoveries. Meanwhile, the nonfarm labor productivity data was unchanged in the fourth quarter, but that was slightly better than the previous estimate, which was a decline of 0.1 percent. While nonfarm output increased by a relatively healthy 3.2 percent, the productivity numbers were weighed down by a 3.3 percent increase in hours worked, with unit labor costs up 2.5 percent. Similar to the manufacturing data described above, nonfarm labor productivity has slowed considerably since the recession, averaging 0.7 percent per year from 2011 to 2017. That remains lower than the 2.7 percent annual growth rate average from 2000 to 2007.